Unusual Form - Smith Brothers Goblet with Wild Rose decoration. 6" tall. Unusual early Smith Brothers - a pair of matching vases, soft pink background with an inverted decoration of a white pond lily amongst blue-green/black leaves, brown stems with a maroon trim. The decoration is quite unusual and dates from the 1870's. 7" tall. Signed Smith Brothers blue pansy decoration humidor with a cream background and a melon-ribbed cover. 6 1/2" tall, 4" wide. Here is a rarity - A matching pair of 8" tall Mt. Washington ring vases in brilliant black glass. Just like lava, but no colored flux, decorated with gold storks in flight; also gold floral decoration. These are most unusual; spoke bottom. Anytime you see these spoke bottoms on ring vases they definitely were made by Mt. Washington. Rare Smith Brothers stoppered vase. Unusual original glossy finish features a green and white background with bright yellow and orange spider mums. This unusual form has its original rare matching stopper. Truly a unique example. 11" tall by 7 1/4" wide. Excellent condition. 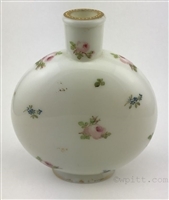 Smith Brothers Canteen or pillow vase with enameled flower blossoms of pink roses and blue forget-me-nots. White opal glass with a gold beaded top and retains the Brookside Antiques paper label. 8 1/2" tall. SMT510. Smith Brothers covered jar. Beige background with enameled decoration of blue pansies and green leaves and russet highlights. Matching cover also has blue pansy decoration in a melon ribbed shape. Signed with rampant lion signature mark. 6" tall. these a matched pair. 8" tall. Decorated Mt. Washington or Smith Brothers rose bowl with hand painted decoration of fish and seaweed on clear glass. 4 ½" diameter, 4 ¾" tall. Mt. Washington enamel decorated water pitcher with iris decoration on front, back and handle. Applied enamel beading on rim. 7 1/2" tall. Excellent condition.